Is it wrong that I enjoyed You Again so much? I guess it's probably because I watched this after Eat Pray Love, so I was down for anything. Yeah, it's silly fun, and it is hopelessly predictable. However, the cast is likeable enough. Kristen Bell, who has developed a knack for being the lovable short actress in really crap comedies, puts herself through everything (literally) and probably gets the most laughs after Betty White. Jamie Lee Curtis and Sigourney Weaver are kinda cool as the feuding mothers. OdetteYustman, who looks like the next Megan Fox but acts like the next Jennifer Aniston, is pretty cool. Betty White, as always, steals the show, and like usual, has the last laugh. There are a few laughs scattered throughout the film, even though it is more about the slapstick than anything else, but it's a great way to spend just under two hours. It just wastes the talent on show a little bit. Ah, I just love Patricia Clarkson, and she is luminous in Cairo Time. Virtually one of the only reasons to see this movie. Cairo Time is a very slow, maybe a little too slow for the normal film going public. But it's slowness allows the viewer to sit and revel in its beauty. In portraying the 'love story', there is a much more believable tension which gradually grows between the two leads and by the time the film has finished, though nothing substantial has happened, there is a lasting haunting effect of their chemistry which ripples through the duration of the credits. However, due to the fact that there wasn't a lot that happened in the movie, and there was a strange plot line about a girl giving a letter to Juliette (Clarkson) to give to her lover which was kind of strange. It's not really a film that I could be expected to take in one sitting due to my slight ADHD nature, but it's a visual delight and acting masterclass, thats for sure. Why was Going the Distance met with such lukewarm reviews? I, for one, loved it. I thought it was a fresh take on the genre that has been well trodden over: romantic comedies. Sure, the end is, you know, predictable, but that fact is forgotten about when the laughs aren't awkward and are actually funny, and everything comes together really nice. Especially the chemistry between Drew Barrymore and Justin Long. They made a couple onscreen which is, for once, actually sweet. Which is something that generic rom coms have been severely lacking of late. Going the Distance features some excellent supporting roles (Christina Applegate's one particularly), is charming and cute, and is a great R-rated comedy. I can understand if people don't enjoy it, though. 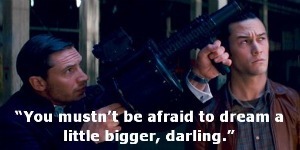 ﻿I love Paul Rudd. I usually love Steve Carrell. 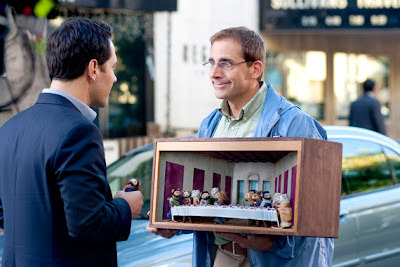 I was warned about the badness of Dinner for Schmucks, but I told myself that everyone was just overexaggerating. Maybe they were, because it wasn't that bad, but it certainly was a really strange and a largely dull movie. Which is a shame, because there is so much talent on display in this movie (not just talking about NZer Jermaine Clement). But once it came to the end, I felt like what I had see was kinda stupid and deranged material that they expected only a 'schmuck' to love. In saying that, parts of it were pretty enjoyable, and it definitely wasn't the worst film of last year as many had said. It was just probably the most disappointing. Barry's mouse art was pretty darn cool, though. Thanks! I usually do too, but I like easy watching.